Tracking keys should be pretty straightforward, right? Well, I guess it is, to the extent that it is a pretty simple process to extract sound from a device that has an audio output. Yet, going straight out of a keyboard into the line inputs of a DAW doesn’t do much for adding personality to the sound of the instrument. A dry and lifeless sound can seem incongruous in a mix of live instruments and vocals, so the challenge is in enhancing the sound to sit well in an ensemble – to contribute to, rather than detract from, the overall composition. Recording keyboards through gear like preamps, reampers, guitar amplifiers and via MIDI can impart grit, saturation and warmth to an otherwise lifeless output signal. Strictly speaking, if your keyboard puts out a line level signal, preamps (microphone preamplifiers) aren’t actually necessary. Preamps are used to boost weaker mic level signals and output them as louder line level signals. The inherent circuitry in a preamp, however, imparts a distinct flavour on the audio that passes through it. Therefore, manufacturers are constantly grappling to design the preamp that lends the signal the “best” flavour. Of course, this is a matter for endless debate among audiophiles, but tracking the keys through a preamp will at least breathe life into an otherwise vanilla tone. Lots of preamps have EQ and compression options. Some, like the Universal Audio 6176 combine preamp and compression in a single valve powered unit and can provide that coveted analog juice. Being in possession of keyboard or synth with MIDI capability is really quite handy in the studio. 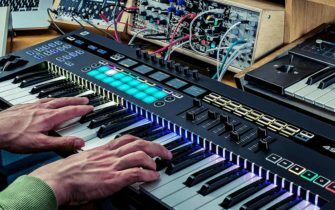 Obviously, MIDI control is convenient for the ever-expanding array of virtual instruments on the market, but having a synth that you can send MIDI into is great for maximising sonic possibilities. The Sequential Circuits Prophet 6 (aside from being an absolute beast of an analog synth) is capable of receiving MIDI information, and thus previously composed MIDI parts that could have been destined for a soft synth can be recorded with precision through a world class synth. Recording keyboards through an amplifier can get the signal into an ambient space, with all the tonal characteristics that amps can impart. Line level outputs can be a little hot for guitar amp inputs though, finding a way to attenuate the level to give you more headroom is wise. Another great way to use an amp is to reamp. This way you can track a clean signal, send it out of your DAW, through the reamp box and then to guitar amp to record. This might seem like a slightly convoluted method, yet the benefits of having clean and dirty signals of the same instrument to blend into a mix are manifold, and can give your more creative scope further in the process. There are many more ways to add flavour to keyboard parts. Stomp boxes and tape machines are yet more choices to add punch, saturation, grit or warmth to untreated keyboard signal. Perhaps the best question to ask when tracking keys is “What kind of flavour do I want?” This should help guide your creative decisions when approaching keyboard recording.